I have finally transfered almost all of my old recipes to my new blog, only one or two more Throwback Thursdays after this one. I am going to start a new weekly theme idea once Throwback Thursdays are over. I would love to hear your input about what you would like to see. I was considering a few things. First, I was thinking about focusing on a different country each week and discussion the traditions, flavors and any other interesting things behind the culture. The other idea I had was to really focus on the senses, since that is what my blog is really about. I was considering zoning in on a different sense description each week and showing how it is represented in certain recipes. For example, I would use the word “tangy” one week and discuss what that really means and give you a recipe that really represents what the word “tangy” means. Please let me know what you think of these ideas and let me know if you have any others that you would like to see! As for this Throwback Thursday recipe, I made this dish for twelve people for my roommate’s birthday this past winter. She loves sesame chicken and chose that for her birthday dinner. This dish is easy to put together and has a beautiful assortment of bright vegetables. Enjoy! 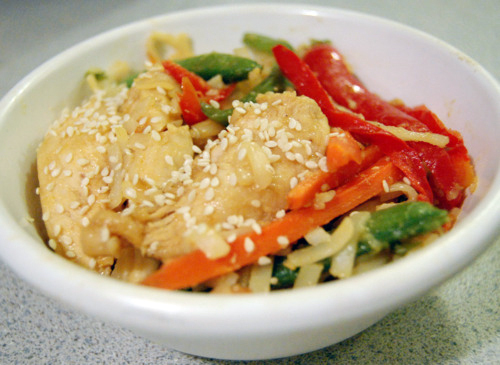 To make sesame chicken, combine flour, ¼ cup sesame seeds, black pepper, Chinese 5-spice powder, and crushed red pepper flakes. Coat chicken strips in flour mixture and set aside. Heat oil in a large skillet over medium-high heat and brown both sides of chicken strips in skillet (about 5 minutes). Repeat until all of the chicken is cooked. Place all of the chicken in a large pot and turn to low heat. Mix in teriyaki sauce, ¼ cup sesame seeds, and honey and stir until sauce thickens and coats the chicken. To make the chow mein, cook the Chinese rice noodles in a pot of boiling water, rinse under cold running water, and drain again. (Drizzle with sesame oil to prevent the noodles from sticking). Heat 1 tbsp of oil and stir fry onion, garlic, and peppers until soft. Add the carrots and sugar snap peas and stir fry until slightly soft. Add the rice noodles and chicken mixture into sautepan and mix thoroughly. Add the soy sauce, salt, sesame oil, and black pepper . Stir fry for 2-3 more minutes, then serve! I like Sesame Chicken and combining it with chow mein just makes it that much better! This looks amazing! I love the idea of having flavor profiles of international cuisines! As for the theme idea? I’d love to see a focus on different countries!! It’s midnight and I want this! It looks so goooood! nice recipe , will surely try at home…. Different countries would be nice but maybe more obscure countries could be of interest to people also. What a great recipe! Love all the different flavors in here, sounds delicious! love this AND the relaxed throwback thursday vibe…if i didnt just eat dinner, I would have made this! Thanks for sharing!